Home / News / blog / What is Glamping? Glamping, as the name might suggest, is like camping, but with a little extra glamour. What does this mean? Well, you get to experience the great outdoors without having to miss out on all of your creature comforts. Traditional camping involves sleeping on the floor, bringing only what fits into a rucksack, and being quite a bit more exposed to the elements than you might be if you’d stayed in a hotel or lodge. In that regard, glamping offers the best of both worlds. And even converted train carriages! Almost anything can conceivably be converted into glamping accommodation, but of course, this isn’t just about knocking together any old shed and hauling a sleeping bag into it. This is about having an environment that allows for comfort and affords you a few luxuries. You usually have a full bed and mattress, for example, as well as insulated walls, some form of heater, electricity, and maybe even a hot tub. In case you hadn’t gathered, ‘glamping’ is a word made by fusing the words ‘glamour’ and ‘camping’ together. This is what glamping is all about, so if you’ve been scratching your head and wondering what all the fuss is about, then this article has hopefully cleared a few things up! 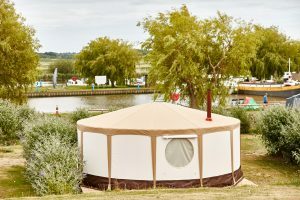 We offer glamping holidays right here at Waveney River Centre in Yurts and Escape Pods, so if you’re thinking of dipping your toes into this style of holiday, look no further.